Over at the Black Agenda Report, you can listen to Bruce Dixon talking about one of the sideshows in ed news these days. He’s referring to the multi-city tour that Duncan, Sharpton and Gingrich are embarking on this fall to spread the Obama administration’s vision of public education. Dixon’s vision veers from the press release version you’ll find on sites like this or this. The Obama administration must be stuck on S-T-U-P-I-D!!! 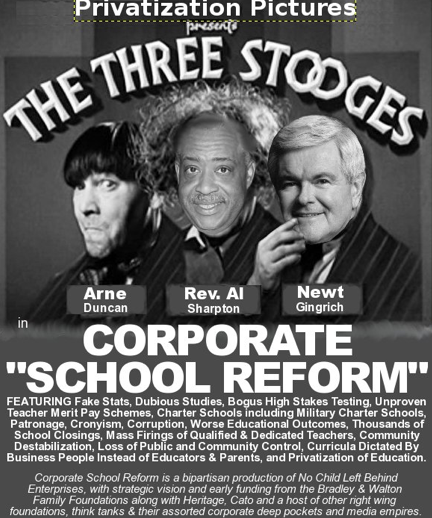 First, to believe in this privatization stuff at all, and then to send this trio out to talk it up. The next productive step is a call to action to advocate what you write. Learn to be an activist in your community, church, school, and yes, the j-o-b. GEM is of course on the same page, and is co-sponsoring a forum on “The TRUTH About Charter Schools” scheduled for Sept 2nd (see sidebar). From the federal level right on down through state and local governments, there are elected officials and business interests determined to get schools like these installed in public school buildings across the city. In every borough, that is, certainly not in every neighborhood (read between the lines on that one). Charters should be finding their own space and not be displacing whole floors of public school classrooms. Pulling them into the system the way Bloomberg and Klein are going about it, and getting a lot of help from Albany, threaten the social fabric of inner city communities. There’s virtually no community input, and laws are being both enacted and broken to allow it to happen. The forum will take place at the State Office Building in Harlem beginning at 6 o’clock. If you plan on coming, you might want to get there early. It might get packed. So, is GEM against charter parents as well? Are charter parents unwelcome at GEM meetings because their children attend charter schools? We're all public school parents who want the best education for our children. We should start working together to ensure ALL children – charter and district schools receive the same benefits, facilities and access to a quality education. GEM is certainly not against charter school parents, or even against charter schools per se. The people who have been working in GEM think in many ways as you do: there should be no disparities in class size, facilities, technology, supplies and books in public education. Neighborhood schools should be fixed when they need to be and not closed down. Governments and corporations cannot be allowed make decisions for parents or teachers like they’re doing now, or break laws that have been enacted to protect children and school workers. The fabrications promulgated by Tweed must cease. Taxpayer dollars should go to schools, not PR machines and data factories. There are coalitions of educators and parents working to get this message out all over New York, Anyone wanting to help reverse the Tweed stranglehold on public schools is welcome in GEM, and from what I’ve heard, all the other groups as well. No charter parent will ever say they want there to be a disparity in the facilities and services provided by charter and district schools. We are all parents of children, mostly minority children, in a public school system and we all want a quality education for our children. I'm glad to read that GEM is not against charter parents. You make reference to data factories. Can you clarify that as well? District and charter parents need to sit down and talk about how ALL children in the public school system can receive a quality education with the same facilities, resources and services. We must work together to provide equal access to a quality education for all children. There are several definitions of “charter school,” which makes the discussion more confusing. I believe the people I am working with are not against the concept of an educational institution that has received a “charter” from a school district or state department of education to operate independently. The charters getting established here in NYC are not operating independently. For starters, they are being granted space in public school buildings, gaining access to student information for recruitment purposes, and drawing a certain percentage of teachers from the ranks of the UFT (who go on leave from the union for a set amount of time). When I use the term “data factories,” I refer to a variety of things, from technology to methodology, that can mass produce statistics to serve any political purpose. Simply, these include: creating a massive data base with new installations (ARIS for one), putting high-stakes testing into many grades (the downside being teaching to the test), instituting school rating systems, and using the analyses of parts or all of the test and rating results to support questionable if not agenda-ridden outcomes, such as school report cards, school closing decisions, divisive merit pay schemes, teacher quality, and of course, public relations. I'd venture to say none of these get to the truth on how well individual students are learning, which makes the whole thing a political exercise. So, it's not improving education that's involved here, but the idea that a corporate/political agenda has in the past decade been foisted upon a certain kind of local population. Most recently it's coming from the highest level of government in the form of Obama/Duncan's “Race to the Top” — the name alone sets an inappropriate goal for any kind of learning. Given the nature of the attack on public ed, I now disagree with this and am opposed to giving public money to any type of charter. I wanted to clarify one thing: charter schools are not public schools though they have been branded as such due to the use of public funding and free public school space. They are most often backed and under the control of private interests with an agenda that is not always clear. But one underlying aspect of almost all of them is to remove the concept of a union and teacher rights. That they use tax money to institute private agendas, often backed by big corporate money, leads to a lack of oversight and unity of purpose that was the underlying factor in the creation of a public school system in this country 200 years ago. The agenda has led to favorable and unequitable funding since charters also get money from outside interests that help them in the competition with local public schools as they wean away parents. What parent wouldn't choose a spanking clean and painted school and lower class sizes? In the short term you may feel and rightly so that you are doing the best for your child. But in the long run when there are no public schools in a neighborhood left and charters start cannibalizing each other, you will see what has been destroyed. Given that, we fully understand the need for parents to find a better place for their child and these parents are never unwelcome in the struggle for a better public education system. Since the PC dealt with a governance system from which charter schools are exempt, you would have to define what role you would want to play as a charter school parent. Maybe a better governance system will lead to you coming back to the public schools. What you and I are opposed to is the lack of oversight, the lawbreaking, the marginalization of parents, the unionbusting (not only teachers, but construction jobs and other school workers), and the national über-directives that have the financial clout to influence decisions at very local levels. Right? On second thought, maybe you would be opposed to me and my friends using public funds for 80% of running our charter. I take it back. I posted some of this comment on Norm's blog as well. If educators, parents, churches or community leaders decide to start a charter school – they can. ANYONE may start a charter school. There are also financial resources available to parents and others who don't know how to write a charter but want to start a charter school. In NYC, the Charter Center is there to assist anyone – parent, educator, pastor etc. in starting a charter school. They provide you with funds to hire consultants to write your charter. Julie – you should start a charter school. If you have other friends/educators who have a vision about educating our children, then start a charter school. If you're against charters sharing space in district school buildings then you can locate your charter in a private space for a cost. But, why not start a charter school – you are very passionate about education. Charters schools are indeed public schools. Parents in NYC may choose to send their children to two types of public schools – district or charter. As an actual parent of a minority child in a charter school, I am happy to have the choice of sending my child to a school I believe will provide a quality education. It is my choice not yours of which school to send my child. You are an educator, a paid and salaried educator. I am the unemployed parent of a minority child trying to give my child the best education possible. If the district schools in my district were outperforming the charters then I'd send my child to a district school. It's still my choice and I am still a public school parent. I take great offense at Norm, who is not a parent or minority or unemployed telling me what's best for my child. These are our children not yours. Those of us who are parents of public school children – both district and charter must work together to ensure ALL children have access to the same facilities and educational programs FULLSTOP! Let me quickly jump in here to tell you that Norm is one of the strongest people you'll ever have in your court. He's retired now, but was in the classroom for I think 35 years and has been fighting for parents' rights and keeping the “public” in public education all this time. He's about as knowledgeable as you can get about the politics of education, and when he comes out with a strong statement as he did, it's from an enormous involvement with the peoples' struggles. I hate to speak for him, put perhaps he was trying to make the bigger point, that we have to educate ourselves really well on what the real agenda is behind everything the DoE is doing and then weigh – individually and collectively – what's best for our own children and for the community we live in. Divisiveness in the local community breeds nothing good. When the DoE gives to some and certainly not to all, in fact when they hurt and displace so many while giving to the relatively few, that is as a core principal very, very bad. No one is thinking poorly of a parent who reaches for the best options for his family, but one hopes that collectively, communities will strive for the solutions that will lift everyone, not just the lottery winners. It's SUCH a hard problem. PS: Above when Norm disagreed with my hypothetical about starting a charter school for friends and family, he put me straight. I was posing that from a different definition of charter than the one that's been in use for several decades and codified into law in 1998. I have to really re-think on what terms, if any, I would agree to chartering, but KEY would be taking a very hard line on disparity. Show me where I told you what's best for your child? I love this “taking great offense” stuff by twisting words and points of view. I have a right to express my opinion on charters and you have a right to send you kids to whatever school you like. If you choose one that is managed by private interests using public money, so be it. And if you like the idea of your child being one of 2% of the kids in a charter school while the rest of the 98% get shortchanged I still don't accuse you of being selfish. It is yoru child after all and you made the lottery. Good luck. I fully understand the need for parents to find a better place for their child and these parents are never unwelcome in the struggle for a better public education system.